Classic Pea & Mint soup is a staple in English traditional cuisine. It’s one of the most healthy soups around, it’s easy to make and most of all it’s super quick, something you don’t usually see happen when cooking soup recipes. The holiday season is just around the corner, so it’s the right time to enjoy light meals before Thanksgiving. Actually, the refreshing taste of this soup packed with vibrant flavors would make a fantastic option for any season, whether is summer time or winter. This Pea&Mint soup version, has all the green ingredients you can dream of, so you can make the most out of all the vitamins and antioxidants they contain. 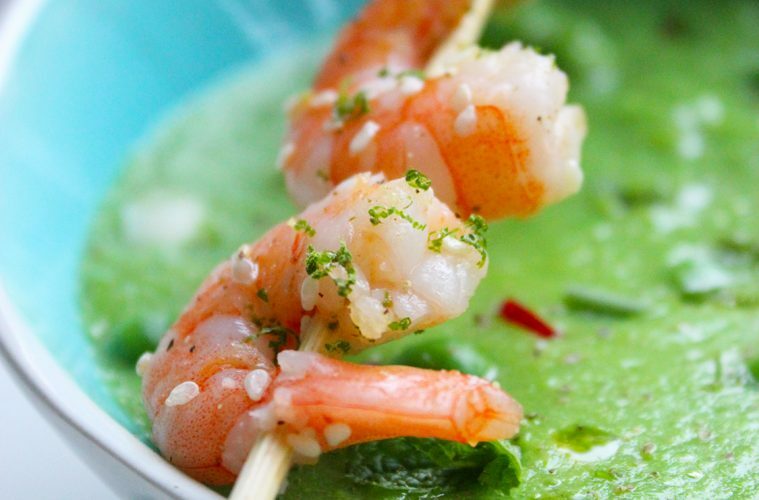 The Thai grilled Shrimp skewers upgrade this soup to a well balanced and complete meal. The ingredients are simple, fresh and easy to find during all seasons, so you can enjoy it all year around. It’s also a handy choice if you’re vegetarian, or have vegetarian guests over for dinner. You can easily serve the grilled king prawns skewers on the side, they’re a great addiction, but the soup is amazing on its own! This pea & mint soup has it all, did I mention it’s also gluten free and diary free? So, even more people can enjoy it! Really,of the many I have tried, this has to be the Ultimate Pea&Mint Soup recipe! Set 2 tbsp of chopped spring onion aside. Put the remaining ones into a large pan with the potato, garlic, thyme and stock. Bring to the boil, lower the heat and simmer for 15 mins. Add peas to the soup and simmer for 3 minutes. Season to taste. Save 2 tbsp of cooked peas in a container to garnish the dish. Stir into the soup mint, sugar and lemon or lime juice, then pour into a food processor and blend until smooth. Garnish with the reserved peas, chopped onion, thyme leaves and salt and pepper to taste. Mix together olive & sesame oil, lime zest, chili, salt and pepper to taste. Thread 4 shrimps through each skewer at two points, through the neck and tail portion. Brush the oil mix on both sides of each skewer, and sprinkle with sesame seeds. Heat until hot a medium grilling pan. Place the skewers and grill for 2 mins on each side, until cooked through. just made this soup for lunch and it was delicious!! perfect after a week of travelling for thanksgiving. thanks for posting! What an awesome idea to serve skewers with a soup like this! Definitely a delicious recipe that I need to try! I really enjoyed the combination,and you can also try with fresh tuna or salmon instead of shrimps, so good!